Things to do in Chile, need ideas? Interesting things to do in Chile? 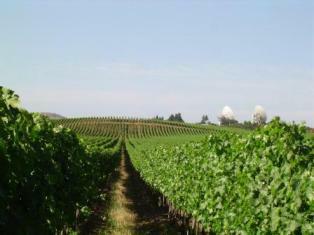 Click Hereto see a list of things to do in Chile! There are tons of activities to do in Chile, you just have to pick where you want to do it.Chile has mountains, lakes, oceans, deserts, volcanoes, lagoons, hills, peninsulas, islands and more. It also has both very hot and very cold climates all year round and every climate in between. So you´ll find a huge list of things to do in Chile. And for those of you that like to site see and hike, Chile is full of beautiful natural areas that haven´t been touched by the modern society. Share what is your favorite thing to do in Chile here! In the far north the sun is out all year around and in some places it never rains. So going to the beaches is never a bad idea here. For those who like to practice water activities such as surfing, body boarding, para surfing, scuba diving, kayaking, fishing and more you can do it all year around. If you’re one of those who like 4x4 adventures, then you´ll have tons of these things to do in Chile. There are a whole bunch of trails and rally’s that cross the deserts,dunes and breaks. They are waiting to be crossed either by a truck, jeep or a motorbike. Did you say land sailing? Yup it’s here. There’s a whole desert area for this activity. For the site seekers, up here you’ll find a whole bunch of national parks and reserves for you to hike and site see. There’s a whole bunch of wonderful things to do in Chile...and see, such as the desert landscape, the different vegetation and animals in this area. Take a bath in the natural thermal baths formed the northern geisers. The northern landscape is a must see for everyone. In the near north you still have warmer climate than the central and south. It’s not so cold in the winter but it might be too cold for water sports, at least in the winter. Away from the coast you can go to some towns and still find sun all year around and maybe even stand to swim during the winter months. In the summer it’s one of the best places in Chile to scuba dive. This region is most popular for bike ridding or jogging along the white sand beach on the coast area. The inland area is famous for site seeing, hiking through the national parks and reserves, pisco tasting and most important of all, STAR gazing. You DON´T want to leave this area without doing this last activity. This area is also the home of one of the two Nobel price winners for literature of Chile, Gabriela Mistral. Visiting the town where she grew up is very interesting and has sort of a special air to it, also a MUST DO. Central Chile is made up of a very fertile central valley that is surrounded by the Andes Mountains and the Pacific Ocean. Since these valleys are so fertile, this is the place to do wine tours for those of you wine lovers (I’m assuming that I don’t really have to mention to you guys that Chile is famous for it’s great wines, but just in case someone didn’t know.... I wouldn’t want anybody to miss out on a great thing like that). This region is great for skiing or snowboarding in the winter time cause of its high mountains. For those who are looking for an adrenalin rush try helisking. It’s also great for visiting some thermal baths to relax in, and maybe get a massage at one of their spas. In the summer there is a very famous spot for surfing that’s recognized through out the world for its great waves. There are also places here where you can scuba dive. The white sand beaches are really beautiful in this area. This is the last region before the sand at beaches start turning dark. This area is distinct for its strong traditions and it is known as the ¨Huasa Zone¨ (Zona Huasa) which means the cowboy zone. This is called so because of the traditional events that are held in this area every year such as the rodeo, horse taming and others. The home of the other Nobel price winner for literature, Pablo Neruda can be visited here. The south is the never ending activity and exercise area. 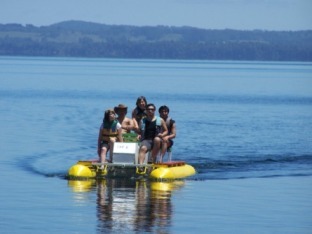 It´s one of the best places to find things to do in Chile. It’s full of lake regions, rivers, mountains and volcanoes to visit. This area is full of untouched land with easy access just waiting for you to come and see them. It has such wonderful vegetation and scenery. 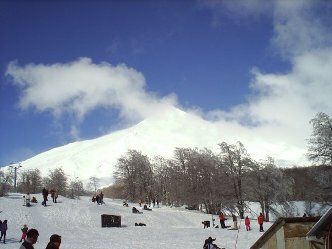 In the winter it has many volcanoes for skiing and snowboarding. After a whole day of snow activities pick from a huge list of beautiful thermal baths with spectacular views of the mountains and rivers to relax your body. Then curl up by a huge wooden fire with your favorite book. During the summer there are beautiful lakes that want to be visited and with them a whole bunch of activities such as biking tours, kayaking, water biking, water skiing. It’s full of national parks to hike up and volcanoes to climb. There are great rivers for white water rafting, and zip lining is another activity that’s common here. There are wonderful trails for horse back ridding. The dark sand beaches in the lakes are great for swimming, the temperature is ideal (the water temperature in the rest of Chile is kind of cold, especially in the ocean). So if swimming is what you want, this is the area. And you fishing lovers, this is the place to be. The lakes, rivers and oceans are filled with huge fish that are sticking their tongues out at you. The Patagonia area is known for its unbelievable landscape full of vegetation. This is the untouched region of Chile. There are tons of routes to do either by horse, bike or walking. There are great excursions for the hiker in you, such as the Torres del Paine National Park. For the kayakers there are a whole bunch of rivers and canals for this sport that will get your adrenalin pumping and will take you to discover unexplored beauties such as glaciers and icebergs. Fishing? Yup it’s here too, there’s great spots to fish surrounded by nature. I know I mentioned gambling as one of the things to do in Chile some where, and didn’t mention it in the text but don’t worry. For all of you who like gambling and nightlife it’s available everywhere in the country and I will get into more detail on where you can find the perfect spot for you. So if you want to know more specific information on one of the things to do in Chile, please be patient cause I’m just starting to write but I’ll have all the information you want in a little while, such as where and how much it costs. Do you have a questions? Ask me! 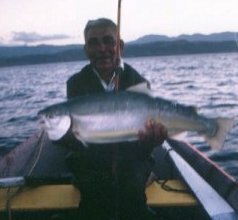 Are yo looking for more information on things to do in Chile, click on one of these activities to read more! Places to go Skiing: Want to go skiing? Here are the listings of every ski resort in Chile, so you can decide where you want to ski. Hiking: Looking for some great places to go hiking? 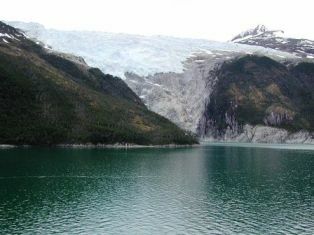 This page lists all the beautiful national parks in Chile, that are great for hikes. Hot Springs: Looking to relax? Start at the hot springs! Chile has tons of hot spring all through out the country, so just choose one! 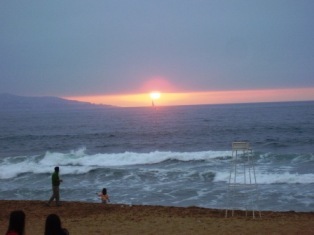 Surfing: This page list the best beaches to do surfing in Chile, so you can catch the best waves.